Archaeologists in 2007 announced there was 'compelling' evidence that they had found the mass burial site of British and Australian troops who were killed during the First World War. They believed that the bodies of up to four hundred soldiers remained in unmarked graves in northern France near the site of the Battle of Fromelles. It was the largest discovery of its kind to date, and the Australian, British, French, and German authorities subsequently had to decide whether to proceed with a mass exhumation of the soldiers' remains. The Battle of Fromelles was an unmitigated disaster. It was conceived as a ruse to divert German attention away from the campaign on the Somme in July 1916. The British and Australians launched an assault on heavily fortified positions in broad daylight. 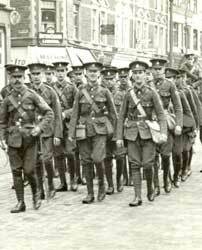 Although they fought bravely they suffered heavy losses. The British withdrew and the Australians had to fight their way back through the German lines. A second assault was cancelled, though the Australians were not told and they lost more men as a result. A geophysical survey has located burial pits in which hundreds of soldiers were buried after the battle. Dr Tony Pollard, the director of the Centre for Battlefield Archaeology at Glasgow University, visited the site. He was able to confirm that, to his knowledge, this was the largest unmarked First World War mass grave to be discovered in modern times. There have been multiple graves in the past, but they have consisted of perhaps twenty to thirty men. In this case the count was something closer to four hundred, according to the available German records. A metal detector survey had revealed a number of artefacts, including metal objects with Australian Army insignia on them. The only likely way they could have got there is on the dead bodies of Australian soldiers. The bodies hadn't been disinterred and buried elsewhere. There was strong evidence to support the belief that the bodies were still buried in that field. In Australia the battle is regarded as one of the most significant in its history. According to Dr Pollard, amongst Australians the Battle of Fromelles is talked about in the same breath as Gallipoli. It was seen there as a huge national disaster. Within the twelve or fifteen hours of the battle 5,500 Australian soldiers were either killed or wounded. But Dr Pollard also added that it held strong significance for the British, despite the fact that the Battle of Fromelles is largely overshadowed by the Battle of the Somme. 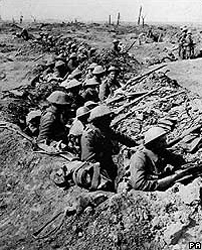 Upwards of 1,500 to 2,000 British soldiers were killed or wounded in that same attack, and several hundred of those may have been in the same grave pits. It was the first time that Australia's troops had seen action on the Western Front. It is seen as an example of how the British empire was prepared to sacrifice its colonial troops with little thought about the consequences. It is believed that Adolf Hitler, then a corporal in the Bavarian reserve infantry, ran messages behind the German lines during the same battle. The bunker which Hitler visited in the 1940s when he came to occupied France was said to be just a few hundred yards from the burial site. The mammoth task of trying to work out who may or may not buried there had already begun. Historian and author Peter Barton, who was also part of the team working on the project, was concerned about the task of dealing with so many remains - a very costly and very lengthy exercise, as indeed the excavation itself would be. The next decision would be whether to exhume the bodies and bury them with full military honours. In 2008 the presence of the bodies was confirmed, and in 2009 the excavation went ahead. A total of two hundred and fifty British and Australian bodies were recovered in the end. The Commonwealth War Graves Commission constructed a new cemetery for formal re-internment, with work being completed in 2010. Fromelles (Pheasant Wood) Military Cemetery lies on the outskirts of Fromelles.